UltraMax means the best in duct performance within the harshest of climates at varying job sites. Throughout the winter season, with snow falling and temperatures dropping, contractors use portable heaters combined with UltraMax ducting hoses as heating solutions to keep job site work staff, water storage tanks (fracking sites) and/or water lines from freezing and shutting down on the job site. Remember, your heater is only as reliable as the duct work you put on it. With UltraMAX’s resistance to cold, oil and more, the choice for ducting is simple. Rely on UltraMAX in your Construction, Oil & Gas, Fracking, or any other ductable portable heating project. 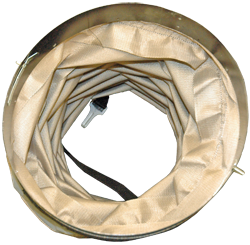 In 2012 the UltraMax™ brand was established and quickly become a popular heater duct within the Fracking, Oil & Gas Industry, as well as throughout the Construction market. You will find UltraMax on job sites throughout Ft. McMurray, The Bakken Oil Fields, and Marcellus Shale Oil Fields. Rental companies and Oil Field service contractors depend on the quality offered in UltraMax’s superior PTFE coated material. UltraMax is able to withstand, even a higher heat source than our popular UltraTex duct, at 550 degrees while operating in severe cold weather climates. When you need reliable heater ducting to perform to 550 degrees, and operate in some of the harshest temperatures, trust in the durability and strength of UltraMax™ brand of ducting.